WASHINGTON The nation's first hologram, circular and pentagonal U.S. postage stamps will be issued next month when the U.S. Postal Service hosts World Stamp Expo 2000, its first international philatelic exhibition since 1989. The Space Achievement and Exploration circular hologram stamp opens the show July 7 at a 10 a.m. first day of issue ceremony. 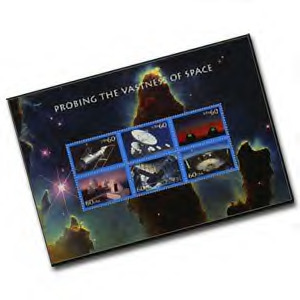 This Express Mail rate ($11.75) stamp features a hologram of Earth, based on images supplied by NASA. On July 8 a second hologram stamp will be issued at a noon first day ceremony. 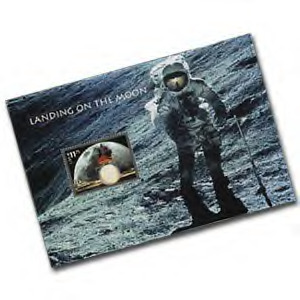 The $11.75 Landing on the Moon stamp features a hologram of a lunar lander, based on computer images and a three-dimensional model from NASA. The stamp is part of a larger souvenir sheet depicting a photograph of astronaut Charles M. Duke Jr., taken by astronaut John W. Young during the Apollo 16 mission in April 1972. 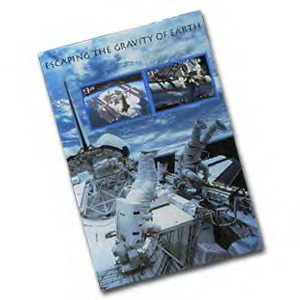 The Escaping the Gravity of Earth hologram stamps will be issued July 9 at noon. These two Priority Mail rate ($3.20) stamps feature holograms of the International Space Station. The first hologram is based on a computer generated NASA image. The second hologram is based on a NASA artist's conception of the station. The photograph appearing on the souvenir sheet is of astronauts David Leestma and Kathryn Sullivan in the cargo bay of the "Challenger" space shuttle during an October 1984 mission. At noon on the fourth day of World Stamp Expo, six Probing the Vastness of Space stamps will be issued. These 60-cent international rate stamps depict an illustration of the Hubble Space Telescope and photographs of the Radio Interferometer (the National Science Foundation's "Very Large Array" on the Plains of San Agustin, west of Socorro, in New Mexico), twin 10-meter optical and infrared telescopes (Keck Observatory in Mauna Kea, Hawaii), optical telescopes (NSF's Cerro Tololo Inter-American Observatory, east of La Serena, Chile), 100-inch optical telescope (Mount Wilson Observatory, near Pasadena, Calif.) and a 305-meter radio telescope (NSF's Arecibo Observatory in Puerto Rico). The souvenir sheet pictures a digitally enhanced image from the Hubble Space Telescope, depicting the stellar nursery known as the Eagle Nebula. 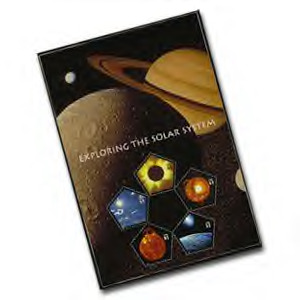 July 11 marks the first day for five Exploring the Solar System stamps, the first pentagonally shaped stamps in U.S. history. These $1 stamps present the following views of the sun: an image of a solar eclipse from a satellite, an illustrated cutaway view, a digitally restored NASA image of sunrise from space, an image of a solar eruption taken by Skylab on Dec. 19, 1973, and a photo from Earth of the sun in a partly cloudy sky. The souvenir sheet depicts a montage of Saturn and several of its moons, imaged by Voyager 1 in November 1980. Also on July 11, the Postal Service will issue the Space Achievement and Exploration stamps uncut press sheet, which is an interesting collectible that includes all five souvenir sheets, presented as they would emerge from the printing press. 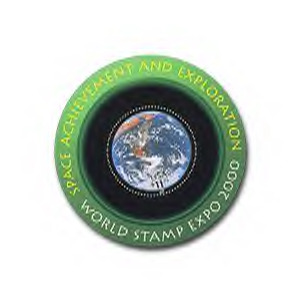 All 15 Space Achievement and Exploration stamps will be available at the show and at Anaheim post offices beginning on each respective first day of issue and, starting the following day, at authorized philatelic centers (located at larger post offices), Postal Stores, online at www.stampsonline.com and by calling toll-free 1 800 STAMP-24.